We can offer you a completely new design or a simple design refresh. 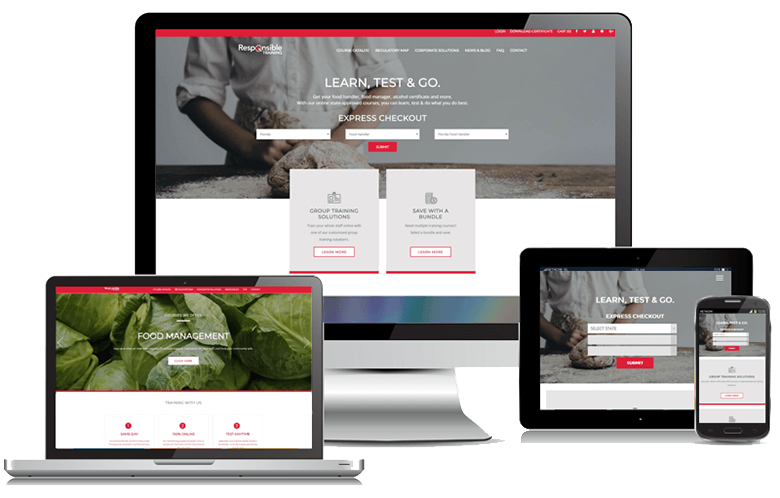 We can build your website into our own Course Merchant CMS - meaning that it's ready for online course sales, even if you're not! We can simply enable the features you need right now, leaving you safe in the knowledge that your website will be able to evolve as your needs develop. Professionally designed website template implemented from the outset. Optional integration with a Payment Gateway for fully fledged ecommerce! Add new pages, new links, and images instantly. Activate and deactivate pages in seconds. Voucher codes, multi-seat discounting, variable tax and shipping bands available. Integration of your chosen social media tools. Embed Twitter, Facebook, LinkedIn and other news feeds as required. CRM and other 3rd party tools integration - the Course Merchant system will grow as your ebusiness needs change. Add course products and take online bookings for your face-to-face classes and workshops! Set optional seat limitations with a waiting list feature. Optional Learning Management System (LMS) integration for instant learner auto-enrollment. Sell online courses and elearning! At the heart of Course Merchant is an easy-to-use website authoring tool. We'll set-up a highly functional website system with a professionally designed look and feel. You will then be able to edit pages, add new pages, delete or deactivate existing pages, add course products and even take online course bookings if you so choose. As its name would suggest, Course Merchant is entirely focused on the needs of users from the Education, Training and Learning communities. With out-of-the-box integration with the most popular Learning Management Systems such as Moodle, Totara, Joule and Desire2Learn, Course Merchant can grow as your needs evolve. Course Merchant will allow you to take course bookings via your website. Optionally link to a payment gateway for true ecommerce, or enable 'Pay by Invoice' for customers who prefer more traditional methods of payment. For face-to-face classes you can choose to implement inventory control with an automated waiting list. Sell physical goods such as books, CDs and DVDs. Course Merchant provides a simple to use online Orders Database – monitor order data and adjust payment and delivery status easily online. Download data for MS Excel import and analysis. Course Merchant Grows with your Needs! Course Merchant has integrations with Affiliate Tracking tools, Customer Relationship Managers (CRMs) and Contact Management applications. Set up partner referral tracking, or join one of the mainstream affiliate networks to increase your overall sales channels. As your needs grow over time, so does Course Merchant's ability to meet those needs. Our entire business focus is on the ebusiness needs of the Training and Education community - if you need it, we've probably already built it!